Two Thurston Middle School eighth grade students have taken it upon themselves to collect sweaters and jackets for the homeless. 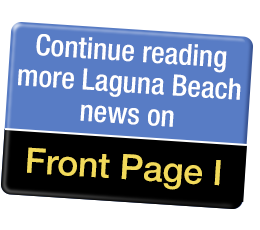 The City Council learned about the project at the March 19 meeting when the boys asked the council to step in and allow them to place collection boxes at various city properties. “Our Pay it Forward Project is called ‘Warm for the Winter,’“ said student Cole Curtis, who has partnered with Ashton Azadian to make life a little easier for the less fortunate residents of Laguna. “This winter has been very rainy and made it clear that this was something that was needed. The response has been great, but we have met challenges in getting the word out to the community. “We have collected many coats and have already made one delivery to the homeless shelter. The boys asked the council to intervene. Mayor Bob Whalen asked City Manager Pietig how the students could place their collection boxes in certain City buildings. City Manager John Pietig said the City’s typical policy does not allow solicitations on government property because the City would need to allow all solicitations in order to be fair. Pietig said that on an occasional basis it would be possible, if the City Council would like to make an exception, for the local students to place their collection box or flyers in certain City facilities. However, he said he would look into the matter. Councilmember Toni Iseman said there might be room at the Woman’s Club or on the [covered walkway] at Gelson’s Market for the Thurston students to place their collection box. Azadian said that he and Curtis want to partner with their city to pay forward and show kindness to those who need it. “I can’t begin to count the number of friends at my school who have told us how much our video inspired them to get involved and do their part for our community,” said Azadian. Azadian thanked his father and Curtis’ father for their help in making their project possible.